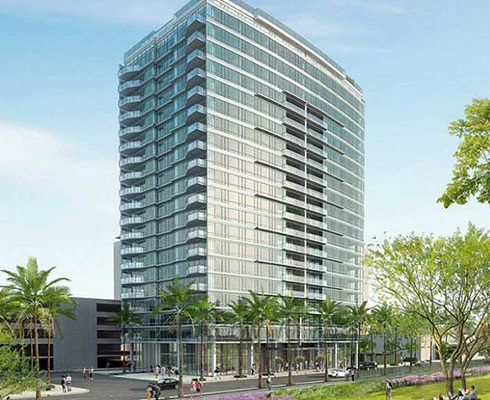 Klorman Construction has been selected as the structural concrete subcontractor for J. H. Snyder Company’s Wilshire Curson apartment tower development named for the nearby intersection of Wilshire Boulevard and Curson Avenue across from the La Brea Tar Pits. The architecture firm of MVE+Partners provided design services, while J. H. Snyder is serving as their own general contractor. The 263.92’ tall 26-story concrete framed building consists of 24 stories above grade featuring 285 residential units and a two-level, 410 car basement parking garage, as well as a rooftop pool deck. “This is another example of our growing reputation and expanded roles on various mixed-use properties, a testament to the hard work and dedication our talented team has developed over the years.” said Bill Klorman, president of Klorman Construction.